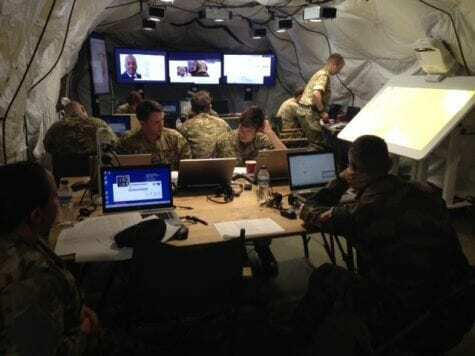 Building on the success of the BT Innovation Centre on Exercise GRIFFIN STRIKE in April 2016, MOD Joint Warfare part-funded a BT Deployed HQ of the Future on Exercise JOINT VENTURE in early July 2016. Prolinx attended the event at RAF St Mawgan to learn more about how the RAF currently operated within an HQ and how they would like to operate in the future, to see how industry can help them do this. Demonstrate technology capabilities that are either ready now, or deliverable within the next 5 years, that will enable better Command and Control (C2) of Joint Forces at the operational level and inform C2 at the lower Strategic and higher Tactical levels. Prolinx were able to exhibit our Secure Early Entry Deployed Service (SEEDS) service, showcasing our deployed capabilities suitable for troops in the field.